A mother battled Pacific Rim Elementary after her daughter’s abuse, Carlsbad stands opposed to giving Port Authority control of the airport and more in our weekly roundup of North County news. The two words coastal homeowners really don’t want to hear are increasingly making their way into local policies: managed retreat. Managed retreat is a planning strategy that calls for removing structures, like homes and roads, away from the coast to deal with erosion and sea-level rise. Homeowners in Del Mar were afraid that even saying the words at public meetings would devalue their property, and they convinced the city to remove it as a tool to adapt to sea-level rise from the city’s proposed local coastal program update. But the California Coastal Commission told Del Mar it must include managed retreat as an option, the Union-Tribune reports. Every city in the state with a local coastal program is required to plan for sea-level rise and include strategies for mitigating its effects. Cities typically look to other tools first, like replenishing sand on the beaches or adapting existing structures to the new threats. These tactics are more palatable for the public, but come with their own pitfalls, like high annual costs and impacts to beach access. As a last resort, cities would look at moving public infrastructure and encouraging property owners to build inland. 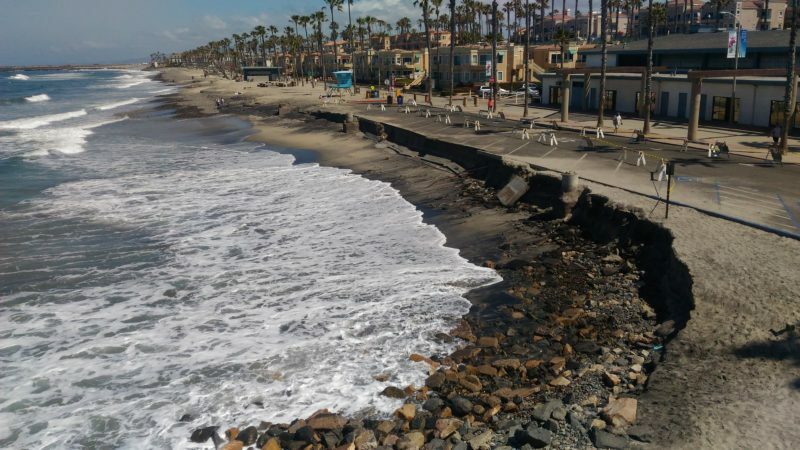 Carlsbad recently released a sea-level rise vulnerability assessment, the first stage of its local coastal program update, which looked at the trade-offs of 20 different adaptation strategies. About half of the recommendations call for moving public structures and discouraging, halting, and removing private development in hazardous areas. Excluding managed retreat from sea-level rise planning may come with its own cost, however. According to the Union-Tribune, Del Mar could lose local control of development if the city fails to include managed retreat in its adopted mitigation plan. After a mother found out her daughter had been abused at Carlsbad’s Pacific Rim Elementary school, she embarked on a path to seek justice. Her experience with the school district and law enforcement left her even more troubled. VOSD’s Ashly McGlone reports that as Christy Heiskala navigated the school and local law enforcement systems for dealing with her child’s sexual abuse, she encountered barrier after barrier: Her intentions were questioned by the school’s lawyers, and a deputy district attorney said the case wasn’t strong enough to prosecute the teacher unless other victims came forward with more evidence. Her own civil suit against the district uncovered systemic failings that allowed the teacher, who faced prior complaints and was observed by other employees engaging in inappropriate conduct, to remain in the classroom. It also launched a career educating schools to prevent sexual abuse and teaching children to take ownership of their bodies. Residents in Carlsbad are again not happy with plans for the McClellan-Palomar Airport — but this time the city’s ire is directed toward a state bill that would take away what little control the city has. The City Council sent a letter to the state Legislature to oppose AB 3119, which would take away the city’s authority of zoning at the property and put the airport’s future under the jurisdiction of the Port of San Diego, the Union-Tribune reported. The bill was mostly aimed at turning over control of San Diego International Airport to the Port Authority, but also targeted 15 other airfields around the county. The Port Authority is governed by a seven-member board, made up of one representative from each of the city councils of Chula Vista, Coronado, Imperial Beach and National City and three members appointed by the city of San Diego. AB 3119 doesn’t alter the makeup of the board. “It’s not going to be good for business, it’s not going to be good for residents,” said Councilman Michael Schumacher, according to the U-T.
• KPBS looked at life for a homeless man in Encinitas, who has an MBA and works three part-time jobs. Ruarri Serpa is a freelance writer in Oceanside. Email him at ruarris@gmail.com and find him on Twitter at @RuarriS.